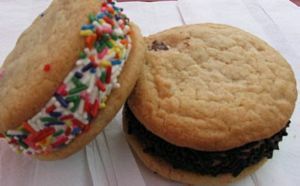 Did you know your school can offer our delicious Roc-N-Rollwich ice cream sandwiches for sale in the school cafeteria? There are 26 schools in Oneida and Herkimer counties currently offering our treats for sale. Nothing's better or fresher than our Roc-N-Rollwiches, which we make right here at our Waterville restaurant and ice cream shop. We use delicious homemade chocolate chip cookies and offer two varieties – vanilla ice cream edged with rainbow sprinkles or chocolate ice cream with chocolate sprinkles. Our ice cream is also produced here in our Waterville facility using only premium ingredients including real dairy. We offer a weekly order and delivery schedule. Contact us for more information about offering Roc-N-Rollwiches in your school. © 2005 - 2019 Roc Star Ice Cream Products, Inc. All rights reserved.